Have a sweet tooth but don’t want to derail your efforts at choosing healthy snacks? If you love the taste of unbaked cookie dough, than you are in for a sweet treat. These almond flour cookie dough balls encased in a sprinkling of rolled oats and cinnamon are kept frozen for an “any time” snack. They taste best eaten right out of the freezer but also taste good (and more reminiscent of raw cookie dough) if they are thawed for a few minutes. Kids love them too so,they are a great after school snack. No refined sugar or added oils. Just a blend of dates, almond butter, almond flour, chia seeds, unsweetened applesauce and a small amount or pure maple syrup. I like using unrefined pure maple syrup when a recipe lends itself to this instead of sugar because it contains calcium, iron, magnesium potassium, zinc and other important minerals. The addition of chia seeds adds a healthy boost of protein without all the added chemicals found in commercial protein bars. Chia seeds are also a great source of omega fatty acids and calcium. 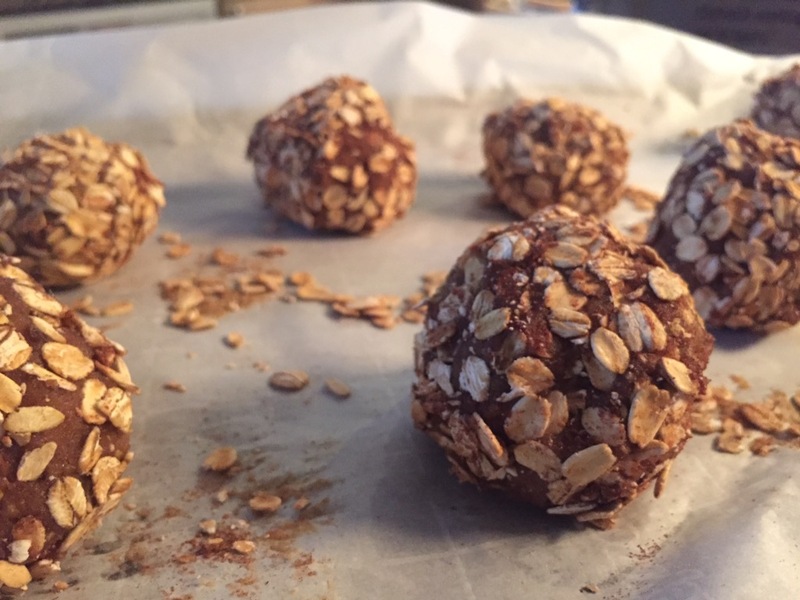 The word “chia” is actually the ancient Mayan word for “strength” so enjoy these delicious power balls and reap the benefits with every bite! First lay out a cookie sheet with a piece of parchment paper. I lightly spray it with a mist of olive or coconut oil. Second, in a big mixing bowl, stir together the almond flour, sea salt, cinnamon and chia seeds. Add to that the mashed dates, almond butter, maple syrup, unsweetened applesauce, vanilla, and water. Third, time to set aside the mixing spoon and use your clean hands for blending all these ingredients together into a sticky ball of dough. I’m it gets too sticky just wet your hands. Fourth. It’s time to roll the dough into balls. Spread the 3/4 cup of rolled oats on a big plate and toss with 1 teaspoon of cinnamon. Shape the dough into about 12 small balls or 9 larger ones. It will help to,wet your hands periodically in between ball rolling . Once you roll a dough ball, roll it into the cinnamon/oats mixture on the plate . You may have to press some of the oats onto the balls. Again damp,hands help. Fifth: place the cookie dough balls on that prepared parchment paper cookie sheet and pop in the freezer. After they harden in about an hour, you can store them in an airtight coatings or ziplock freezer bag and keep there until ready to eat. ← “Help” and Wellness….The right coach is the answer to winning results. These are really incredible I was lucky enough to try them today and I want to have one a day. Delicious! I need to get started making another batch right away! Thanks Laura!